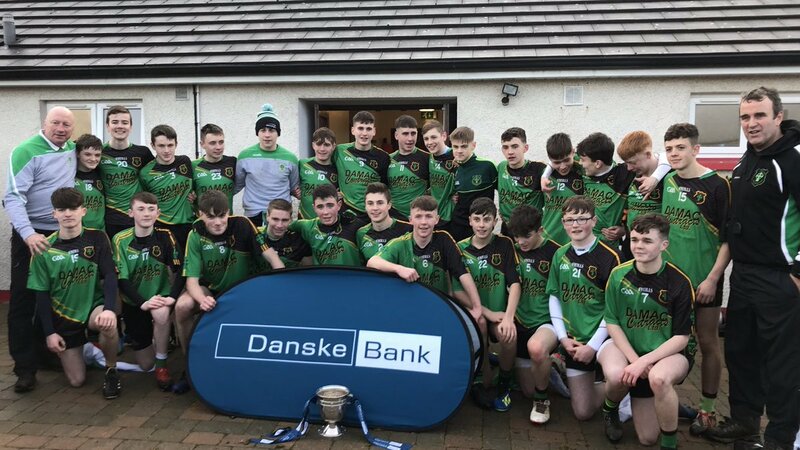 After two games and two periods of extra time only the minimum separated these two sides as Dean Maguirc Carrickmore shaded another enthralling encounter with St Pius X Magherafelt to lift the Danske Bank Rafferty Cup at Stewartstown on Saturday afternoon. As was the case with the original game there was little between two well drilled sides with the Tyrone lads just about deserving their success on the day. Dean Maguirc may have started with the same 15 from the drawn game but it was the positional switches that their management team deployed at the second time of asking that went a long way to winning them the game. Team captain Micheal McCann led by example with an inspirational display at corner back having started the original game at midfield, the Greencastle clubman curtailing dangerman Darragh Wade who kicked 0-7 first day out. Oran Toal was moved to the “40” and he caused havoc every time he gained possession while Sean Conneely and the outstanding Packie Quinn were also to the fore for the winners. St Pius X more than played their part in a thrilling encounter with Ryan Laverty, Michael Forbes and Aaron Donnelly among their best players on the day but in the end their efforts just came up short. Forbes opened the scoring for the wind assisted Magherafelt boys within 60 seconds of the start and by the 10th minute they had established a 0-4 to 0-1 lead thanks to efforts from Donnelly (2) and Joey Devlin, James Donaghy on target for the Dean. A Donnelly “45” stretched St Pius X’s lead further but in the 21st minute the winners struck for a brilliant goal. McCann and Tiarnan Teague were involved in the build up with the all action Quinn finishing in style to the net. Toal then grabbed a fine individual point and while his opposite number Caolan McCann replied at the other end it was clear that Carrickmore now had the upper hand. Midfielder Teague pointed via the post and that was followed by scores from Toal and Michael Rafferty to leave Dean Maguirc leading 1-5 to 0-6 at halftime. Scores proved difficult to come by in the third quarter but there was plenty of drama as Dean Maguirc lost Donaghy and Cathair Kelly to black cards within three minutes of each other while Donnelly and Wade helped bring Magherafelt level. Conneely and Toal responded with converted frees for the winners before Lorcan McGarrity eased them three in front with eight minutes left to play. 60 seconds later though the sides were level when McCann and Charlie Crozier combined for Donnelly to finish low to the bottom left hand corner of the net. The momentum now seemed to be with the Derry school but Dean Maguirc rolled up their sleeves with Quinn placing Zak Devine for the lead point before Toal weighed in with his fourth of the day. With the game now in injury time it was going to take a goal to rescue St Pius X but all they could muster was a point from Doherty. The final whistle marked a third Ulster Schools title in a row for this group of players, all the more remarkable when you consider that they have moved up a grade in each of those three seasons. Dean Maguirc Carrickmore: D McCrory, M McCann, C Cuddy, C McAnespie, C Meenagh, P Quinn (1-0), C Kelly, S Conneely (0-2, 2F), T Teague (0-1), Z Devine (0-1), O Toal (0-4, 1f), D Morris, J Donaghy (0-1), L McGarrity (0-1), M Rafferty (0-1).